Covers a room 200-300 sq. ft. 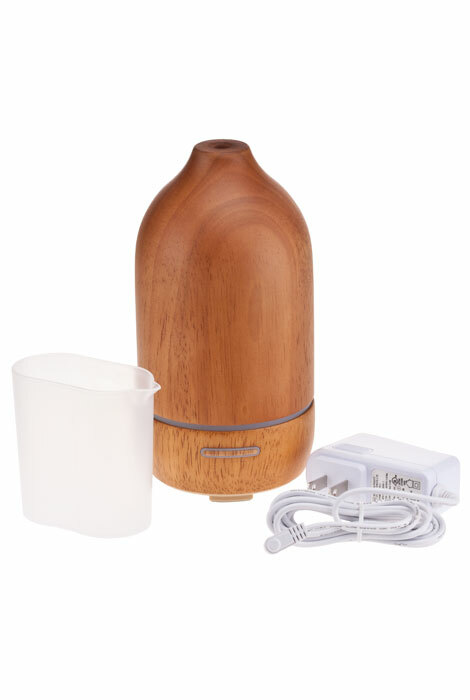 Uses – For use misting the air and diffusing pure essential oils. 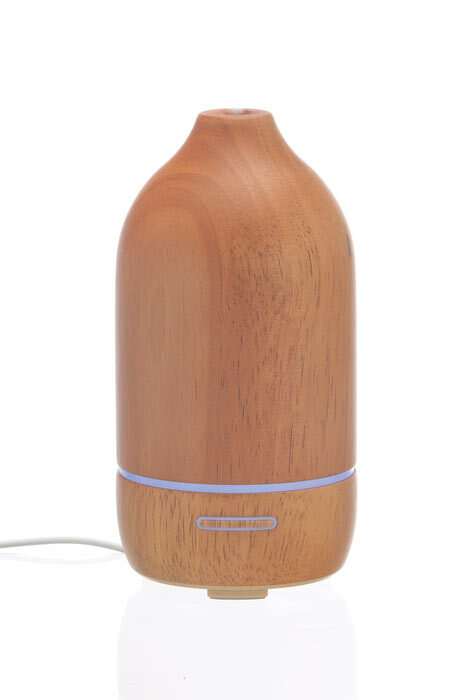 Crafted from fallen trees in Thailand, this natural wood diffuser appears simple yet the streamlined design houses the latest in ultrasonic technology to perform strong therapeutic misting. Benefit from the positives of aromatherapy for up to 7 hours, with or without essential oil fragrance. For aromatherapy benefits, add a few drops of essential oil to the water reservoir. The unit uses just 2.71 fl. oz. of water, yet covers an area of 200-300 sq. ft. The revolving rainbow of lights adds flowing color and ambiance when illuminated. The use of colored lights, called chromatherapy, is thought to have soothing effects. The light can be used without scent, and vice versa. How do I use the Natural Wood Diffuser? 1. Remove the outer and inner covers from the base. 2. Connect the AC adapter to the DC socket on the main body, then plug the adapter into the wall. 3. Fill the water tank with cool tap or bottled water to the fill line (2.71 fl. oz). 4. Add a few drops of your choice of essential oil for aromatherapy directly to the water if desired. 5. Replace the inner and outer covers. 6. The unit will automatically shut off when water level becomes too low. 7. Use only 100% natural essential oil. 8. Unplug when not in use. Left side – Light: 1st push rotating color; 2nd push freezes the rotation; subsequent pushes scroll through a variety of color options; press and hold at any time to turn lights off. Right side – Mist: 1st push continuous; 2nd push intermittent; 3rd push OFF. Avoid any spillage of water by keeping the unit upright at all times. Empty the water tank when not in use. Misting creates humidification. Do not place the unit on a surface that may become damaged by water. Wipe up spills immediately. can it be used in Australia ? BEST ANSWER: Thank you for your question. It should be able to work. It will need an outlet adapter to work with Australias outlets. We hope this information will be of help to you.